Nose: Smoky minty aromas and dull leather, peppered with orange extract, lemon juice and a pinch of sea salt. 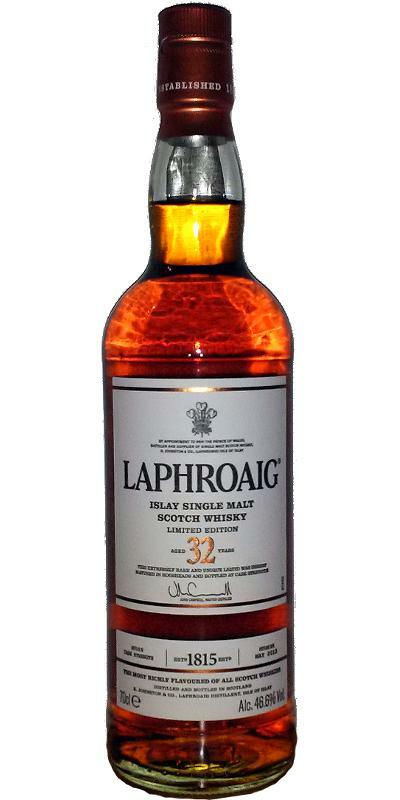 An invigorating freshness of grapefruit, lime peel and sweet honey swings in between - little seasoning, almost peat-free, actually Laphroaig atypical, but quite alright! Finish: Medium length - according to the taste and hints of dry wood. If something is watered down over the finish and sounds dry with smoky lemon aromas. Remark: 1.200 Euro? A sheep in wolf-fur !! The 88 points are owed to the not so bad nose. Fantastic, as it builds up in the nose. On the tongue a poem, the long finish a dream. 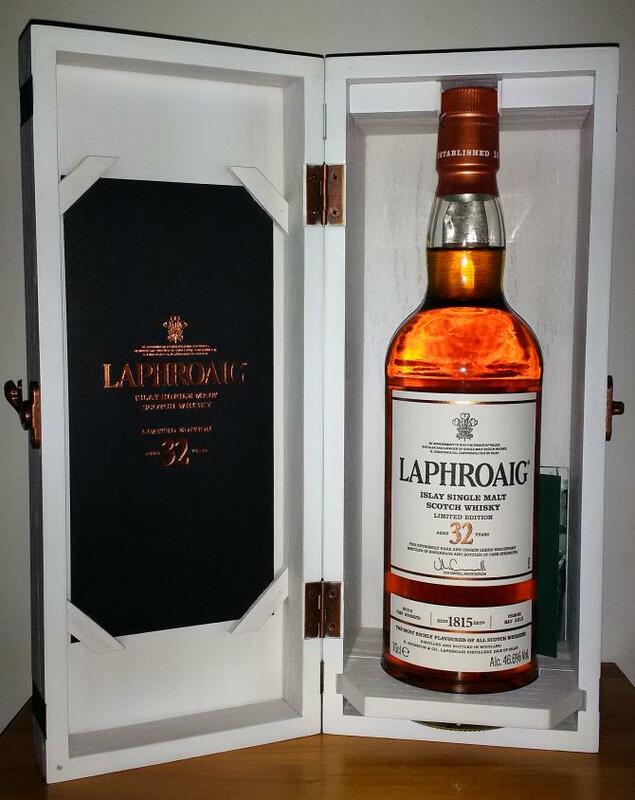 Perfectly matched flavors, ingenious Laphroaig. Very sweet first encounter in the nose: sweet black cherries, glazed apple, vanilla kipper - and then pulls a emerging fine smoke, which previously waberte only as a clue in the background, out of the candy store, to the beach, out to sea. Now salt and the smell of dune grass in the sun, campfire smell blows over, sweet-salty seaweed tickles the nose. Seamless from mouth to nose: the beach fire with dry wood and dry branches still patters. A fine, but nevertheless intense peat smoke note lays on the tongue, mixes with cocoa and coffee beans. Vanilla pods and cherries lend sweetness. Salt, some (cayenne) pepper and rosemary give seasoning. Now also phenolic, medically. Menthol makes for a cool breeze after a while. Long and dry. Menthol still cools, and the wind from the sea has refreshed once more, bringing over the smell of seaweed, peat smoke and a roast over the campfire. In my book, this is Laphroaig at its best - I think this whisky really needs a great deal of cask time in order to really be at its best. The price is of course very high indeed, so not much bang for the buck going on here. Still, a fantastic dram. Mild toffee infused tarry oil, wood polish with a wonderful citrus fruit presence, majestic but restrained old oak, some dark berries, old and pleasant leather on an old sailing ship, light liquorice covered with heavy and woody malt. Very complex, changing a lot. Layers of soft and elegant smoke and tarry oil slowly pull back to reveal a beautiful sherry note. A gentle but firm sea breeze. A nice refined heathery presence. Heather, flowers, tarry oil, malt and old wood dancing around just beautifully, after a while an until now subdued honey note comes more to the fore, wooden spices mixed with cream, also orange chocolate, some tropical fruit going on in the background, dark syrup, matured seaweed (if that makes any sense), fantastically integrated subtle but still “demanding” smoke, smoked vanilla, nice and subtle nuttiness, turning more citrusy over time with white flowers. Stunning nose! Follows the fantastic nose very closely. Wonderful and constantly changing play with citrus, red fruits, sherry spices, cream/vanilla, smoke and oil - in a perfect symphony. Some pine forest, mint and eucalyptus after a while. The texture could be described as cream mixed with light engine oil in a sense. Long. Follows the palate closely. Beautiful unburnt peat. Almost completely free of any bitter bite in the very end (like I pretty much always get with younger Laphroaigs). Very malty throughout, like sucking straight on a peated piece of malted barley, the smoke is refined and powdery, really subtle sherry spices going on in the very end. The tarry oil mixes with some chocolate and creates a remarkable combo together with the rest of the flavours. Nose: quite… well… normal. 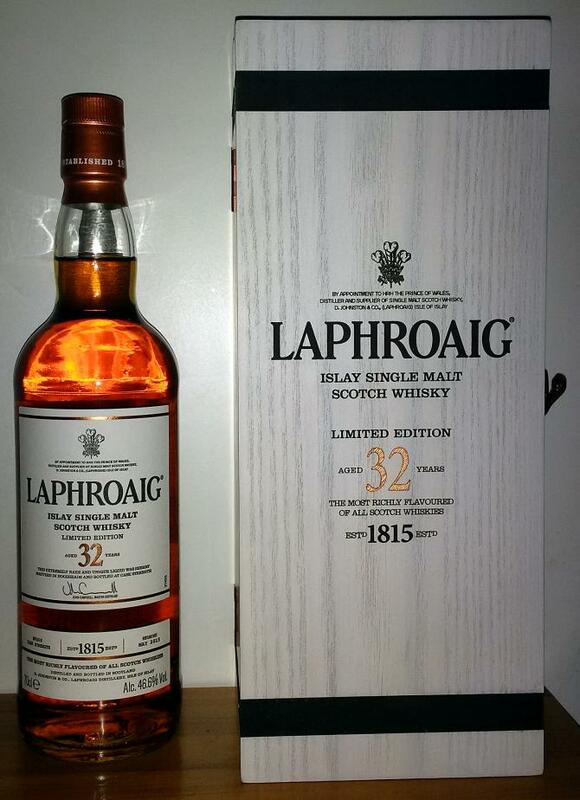 Really old Islay whiskies tend to have less peat smoke and sometimes a glorious fruitiness. 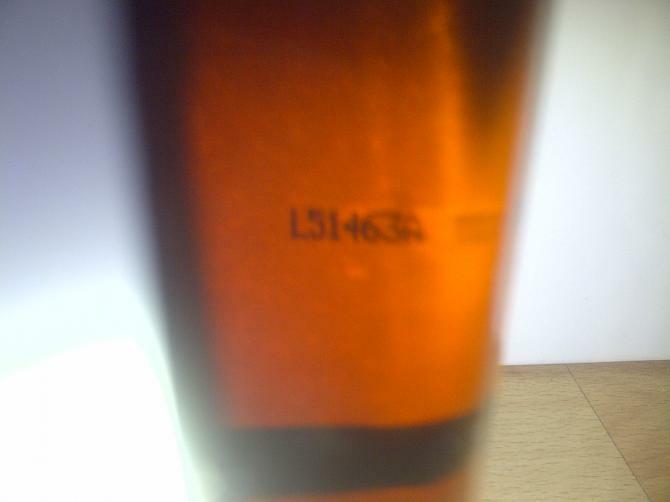 This one is still rather sooty, with quite a lot of ashy notes. Plenty of menthol and eucalyptus as well. Behind this, there are great sherry notes: toffee, dried figs, cinnamon and brown sugar. Hints of red berries, maybe a little ripe mango in the background. Subtle raspberry vinegar. Roasted peanuts. Mouth: again a deep smokiness and tarry notes up front, something diesel-like and ashes, before it gets to a nice fruitiness. Raisins but also lots of pink grapefruits and a faint tropical note (mango, papaya). Signature medicinal and coastal notes (iodine). Nutmeg and pepper. Leather. A lightly acrid earthiness too. Finish: long, warm and smoky. Vaguely sweet but mostly savoury, with dark cocoa and ginger. This was surprisingly peaty – I’d think of this as modern production rather than a Laphroaig from a previous era, but that doesn’t make it less great. It’s nicely polished and balanced, which makes the price almost fair. Around € 1200 but prices tend to differ. An outstanding Laphi who was allowed to mature in super barrels. The smoke was almost completely degraded over the long term. Only had 2.5 cl, but they were worth every penny! Have rated him very high, here is "if not now, when?" First there was the smell of a dying fire; embers and ashes. There is leather and oak. A faint smell of the sea. after some breathing there is definitely sherry, dark chocolate, a hint of raisins. Long, ever so long and warming. Simply great. Dark chocolate, overly ripe red apple, some sherry, a faint smokiness.